Simplify your home’s climate control with this exceptional Honeywell YCT33A1000 Econ M/Volt thermostat from Today’s Concept. For simple, worry-free operation, the Honeywell YCT33A1000 Econ M/Volt model can’t be beat. 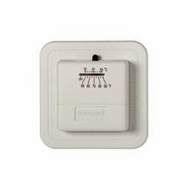 Use this Honeywell Econ M/Volt thermostat with central gas or oil heating systems in any home. For easier installation, this Honeywell YCT33A1000 Econ M/Volt unit also includes a decorative back plate that covers wall marks from your old thermostat.